The Hybrid Mattress – Is There a Debate? Since the term “hybrid” has been used to define a product category, retailers are telling me that their average unit selling price on the innerspring category has improved dramatically. I think the products that producers are building get a lot of the credit for that, but my sources tell me that naming the category hybrid has helped a great deal. It just gives the RSA a way to talk about the classification of products and romances the sleep system enough to make it more interesting and compelling. Why stay away from using the term “hybrid” just because your competition is? Nobody can own the class of product because it is a descriptor of a construction of a certain type of sleep system. When you think of a hybrid car, do you actually attribute that to one manufacturer? Hybrid defines how something is made and if you look at other consumer product categories, there are many examples of this to support my point. If it is easier to explain a mattress product to a consumer using the term “hybrid mattress,” why in the world wouldn’t you embrace that? Put yourself in the shoes of a mattress shopper, and remember that things are confusing enough to them. If you do something to make the experience better, you should be able to increase your chances of selling your bed. Different names, different ticking, constant “SALE” pricing, no perceived bottom to the price on top of that, an increasing number of constructions, financing options, etc. – need I go on? Simple sells; ask Apple. RSAs tell us that it does in fact increase the ticket and shortens the selling process. Working as a manufacturer for the majority of my career in this industry, I understand how difficult it is to get something to stick during a Saturday morning training meeting with the RSA. If using the term helps them communicate value to their customer, isn’t that a win for everybody? The term “hybrid mattress” was created to simplify a conversation in the industry and connect with the consumer in a way they could very easily understand. I remember selling innerspring mattresses with memory foam a long time ago, so this is nothing new – there is no doubt. BUT WHO CARES! Nobody has ever claimed that it was an original way to make beds – it was just a way to shift the conversation to something better. Have you been using the term in your conversations? Do you feel strongly one way or the other? Tell us in the comments section! P.S. Winners find a way to win! Last week I told you about my son Nick and his inside-the-park home run, so in the interest of equal time I feel it is important to share something quick on my daughter Gabby. 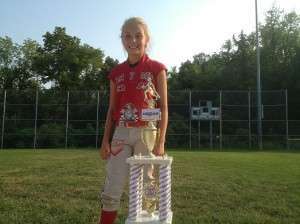 She plays on a 10-and-under fast-pitch softball team called the Battitudes. (Love these girls!) They were in the Kansas/Missouri State Championship tournament this weekend in Kansas City and they battled. In order to make it to the championship game, they beat a team after three extra innings. They ultimately took second place in the tournament but played like champions. I learn so much from watching my kids do stuff like this. Her heart and desire to win inspired me in a big way. There was no complaining about the heat, bad calls by the umpire, or the fact that she was worn out after playing four games that day. This team of girls fought all day long and drove hard until that last out. Sounds a lot like the winners in our industry. I hope your kids inspire you the same way.